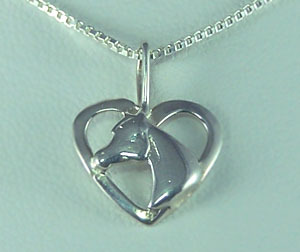 "Horse Head in Heart Pendant"
Horse Head in heart sterling silver pendant great for anyone into horses of any kind. Keep it close to your heart! This sterling silver Horse Head pendant would make a wonderful gift for the horse admirer in your family.